This is the BILINGUAL BUNDLE which includes both the English and Spanish version of this test and an answer key. 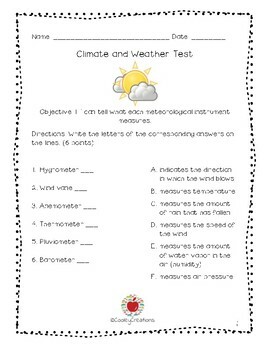 This is a test I created for my 5th Grade Dual Language students after teaching a unit about Climate and Weather. This could be used as either a test or a study guide. 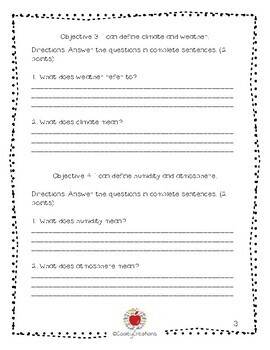 The test covers 8 different objectives and includes matching of words with definitions, matching of pictures with item names, short answer questions, listing items, and the labeling of climate zones on a blank picture. 1. Yo puedo decir que mide cada instrumento meteorologico. / I can tell what each meteorological instrument measures. 2. Yo puedo identificar los instrumentos meteorologicos. / I can identify meteorological instruments. 3. Yo puedo definir el clima y el estado de tiempo. / I can define climate and weather. 4. Yo puedo definir la humedad y la atmosfera. / I can define humidity and atmosphere. 5. Yo puedo nombrar factores que influyen el estado del tiempo y el clima. 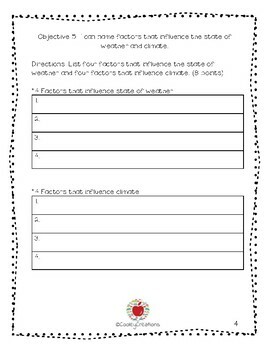 / I can name factors that influence weather and climate. 6. Yo puedo identificar y nombrar las zonas climaticas, los polos y la linea del ecuador en la Tierra. 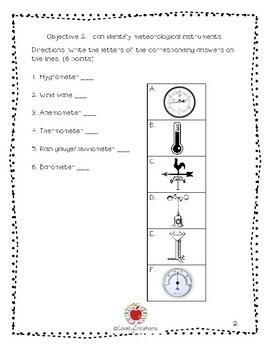 / I can identify and name the climate zones, poles, and equator on Earth. 7. Yo puedo indentificar la zona climatica en que nosotros vivimos. / I can identify the climate zone in which we live. 8. Yo puedo explicar como es el clima en algunas zonas climaticas. / I can explain what climate is like in some climate zones.